UW-Eau Claire senior Sydney Miller of Neillsville uses a shovel to clear the snow from her car Thursday in Eau Claire. View more photos at LeaderTelegramPhotos.com. 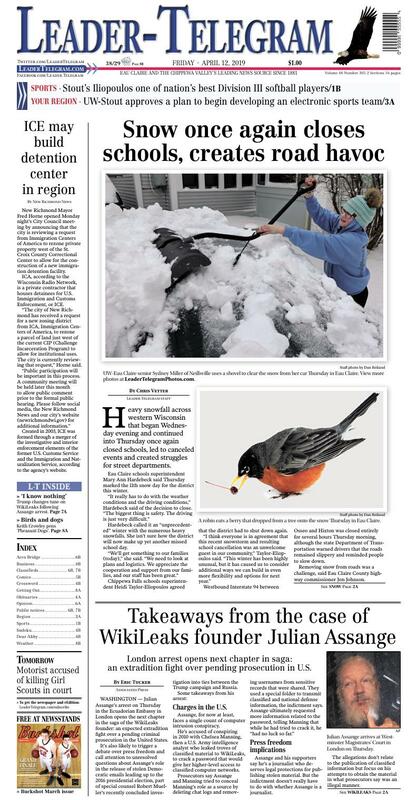 A robin eats a berry that dropped from a tree onto the snow Thursday in Eau Claire. Heavy snowfall across western Wisconsin that began Wednesday evening and continued into Thursday once again closed schools, led to canceled events and created struggles for street departments. Eau Claire schools superintendent Mary Ann Hardebeck said Thursday marked the 11th snow day for the district this winter. Hardebeck called it an “unprecedented” winter with the numerous heavy snowfalls. She isn’t sure how the district will now make up yet another missed school day. Chippewa Falls schools superintendent Heidi Taylor-Eliopoulos agreed that the district had to shut down again. Westbound Interstate 94 between Osseo and Hixton was closed entirely for several hours Thursday morning, although the state Department of Transportation warned drivers that the roads remained slippery and reminded people to slow down. Removing snow from roads was a challenge, said Eau Claire County highway commissioner Jon Johnson. Salt mix wasn’t working much in melting snow, he added. “The rain dilutes the salt we used,” Johnson said. Rain gave way to snow, but then freezing rain fell on top of it. “It made ice sandwiches on the road we can’t get off,” he said. Chippewa County highway commissioner Brian Kelley agreed that the roads are slick. Kelley said the county’s highway committee will be reviewing the costs of this winter’s snow removal at the next meeting, as February alone totaled $922,000. The county usually estimates about $1.5 million for the entire year. “It’s definitely an expensive year,” Kelley said. Chippewa County Sheriff Jim Kowalczyk said his department received calls of 30 different crashes Thursday morning, with nearly all of them of cars sliding off roads and into ditches. However, no injuries were reported. “They were driving too fast for conditions,” he said of motorists. Two semis also couldn’t get up the ramp onto Highway T from Highway 29, he said. The National Weather Service reports the Chippewa Valley received 11.3 inches of snow between 4 p.m. Wednesday and 11 a.m. Thursday. “That shatters the official all-time record,” said meteorologist Caleb Grunzke. With this snowfall, the Chippewa Valley has now received 98.7 inches of snow this winter, he said. More snow could still come today, he added. “It’s not looking like a lot — an inch at most,” Grunzke said. The snow over the day makes the second-most ever in a 24-hour period in April for the Chippewa Valley, Grunzke added. The good news is it won’t last long. A protester demonstrating in support of WikiLeaks founder Julian Assange holds placards outside Westminster magistrates court where he was appearing Thursday in London. Police there arrested Assange at the Ecuadorean embassy for failing to surrender to the court in 2012, shortly after the South American nation revoked his asylum. New Richmond Mayor Fred Horne opened Monday night’s City Council meeting by announcing that the city is reviewing a request from Immigration Centers of America to rezone private property west of the St. Croix County Correctional Center to allow for the construction of a new immigration detention facility. ICA, according to the Wisconsin Radio Network, is a private contractor that houses detainees for U.S. Immigration and Customs Enforcement, or ICE. “The city of New Richmond has received a request for a new zoning district from ICA, Immigration Centers of America, to rezone a parcel of land just west of the current CIP (Challenge Incarceration Program) to allow for institutional uses. The city is currently reviewing that request,” Horne said. Created in 2003, ICE was formed through a merger of the investigative and interior enforcement elements of the former U.S. Customs Service and the Immigration and Naturalization Service, according to the agency’s website. It now has more than 20,000 law enforcement and support personnel in more than 400 offices in the U.S. and around the world.